The Men’s Singles competition resumed with Round of 16 action on the early afternoon of Saturday 11th November as the world’s elite players looked to extend their campaigns at the Seamaster 2017 ITTF World Tour Platinum German Open. Arguably the standout match of the round came right at the bottom of the draw as the second seed Xu Xin edged to a seven games victory over the unseeded player from Portugal Marcos Freitas. Very little separated the two players with each game being won by a four point margin or less, but despite a brave display from Marcos Freitas it was the pen-hold master Xu Xin who narrowly came out on top (11-8, 12-14, 12-10, 7-11, 11-8, 7-11, 11-7). Xu Xin will return to action in the evening session of play with a quarter-finals fixture against Korea Republic’s Lee Sangsu, who pulled off a stunning upset against Japan’s Jun Mizutani (11-3, 11-7, 4-11, 10-12, 9-11, 11-8, 16-14) to eliminate the sixth seed from the competition. Lin Gaoyuan has safely progressed from the Round of 16 following a strong outing against Chinese Taipei’s Chuang Chih-Yuan. Seeded eighth for the competition, China’s Lin Gaoyuan was relatively untroubled by the 13th seed requiring just the four games (11-6, 11-9, 11-6, 12-10) to earn his place in the next round. “I think I played okay today, but Chuang Chih-Yuan didn’t seem to be able to play his best. In the next match, I’ll see if I can take revenge for my World Cup loss”, Lin Gaoyuan. The defeat Lin Gaoyuan refers to came at the Liebherr 2017 ITTF-Men’s World Cup where the Chinese competitor held a 10-4 lead in the deciding game before going on to lose out to Germany’s Timo Boll in the quarter-finals. Now the two will meet in the last eight of the Men’s Singles tournament in Magdeburg after 36-year-old Timo Boll successfully saw off France’s Simon Gauzy for the first time at an international event since 2015 (6-11, 12-10, 11-9, 11-7, 11-2). “Lin Gaoyuan seems to be in good shape again, but I know how to play against him. It’s still not going to be easy because he has a lot of variations in his play and is very good with the smaller details”, Timo Boll. 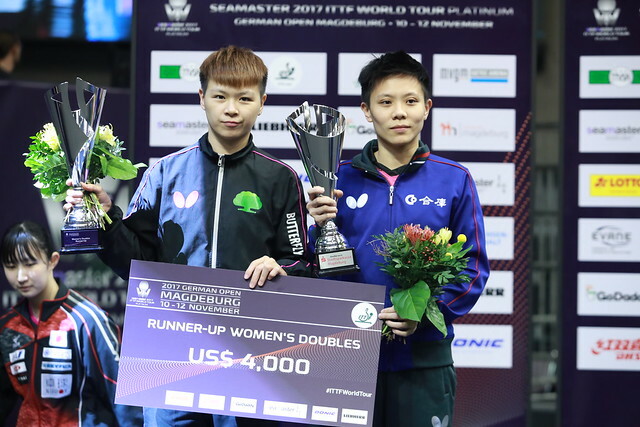 Wong Chun Ting, who has his sights set on reaching the upcoming Seamaster 2017 ITTF World Tour Grand Finals, picked up a positive result from his Round of 16 encounter against Tiago Apolonia while there were also victories for Dimitrij Ovtcharov, Kenta Matsudaira and Fan Zhendong.